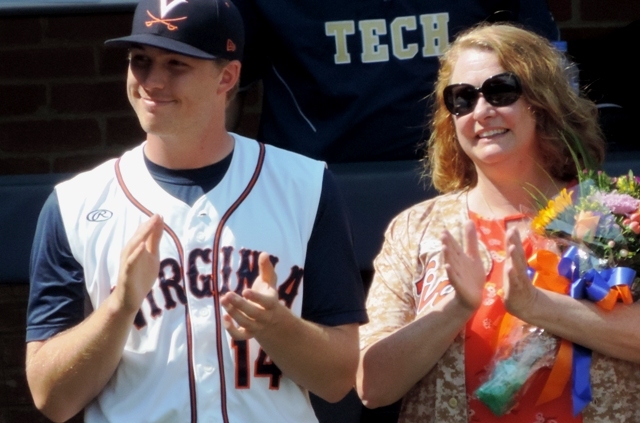 “Ladies Day”: The Moms Who Love Baseball. The Moms Who Love Purple. In the days before radio, and television, and those horrible Facebook Live broadcasts, major league baseball was hard to follow from afar. In 1893, the major league was just a dozen teams huddled together in big East Coast cities and extending only as far west as Chicago and St. Louis. Minor league baseball filled in everywhere else. In the early 1890s, the California League offered “Ladies Day” free admission to female fans at every baseball game. Free admission for ladies at every game “is not known in any other baseball city in the country,” The San Francisco Call reported. The California League was, in 1893, just these four teams: the Los Angeles Angels, the Oakland Colonels, the San Francisco Friscos, and the Stockton River Pirates who became the Sacramento Senators before the season was through. In May 1893, the Friscos and the Colonels squared off for a weekend series at San Francisco’s Haight Street Grounds. Wait. Only One Game Free? What!? The league announced that there would be no more free ride for the ladies. “Ladies Day” would be just for one game at each series. Female fans would have to pay regular admission to the rest. Occasional free admission “Ladies Days” continued on in big league ball here and there, although visiting teams generally hated them because, naturally, their take of the day’s gate was reduced as a result. 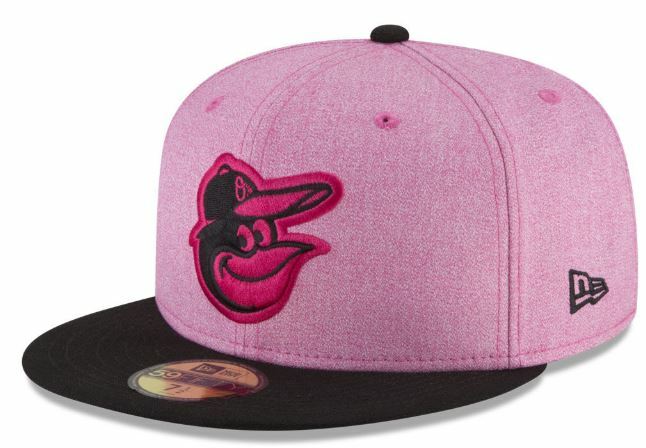 Today, baseball honors all the moms in the world by charging them full admission, but adorning its teams in pink baseball caps, pink bats, pink socks and … well, what mom doesn’t love pink? Jim, a Washington Senators shortstop. The family built a ball field where their sons learned to play and Mother O’Neill tended to professional players who happened through Scranton, by way of Minooka, on barnstorming tours. “It was here that John McGraw, Hughey Jennings, Ty Cobb, Johnny Kling, Frank Chance, Roger Bresnahan, Hal Chase, ‘Wee Willie’ Keeler of ‘hit ‘em where they ain’t fame,’ stopped to wash and partake of Mother O’Neill’s supper before returning to Scranton and the trains to the large cities,” The Scranton Republican wrote. 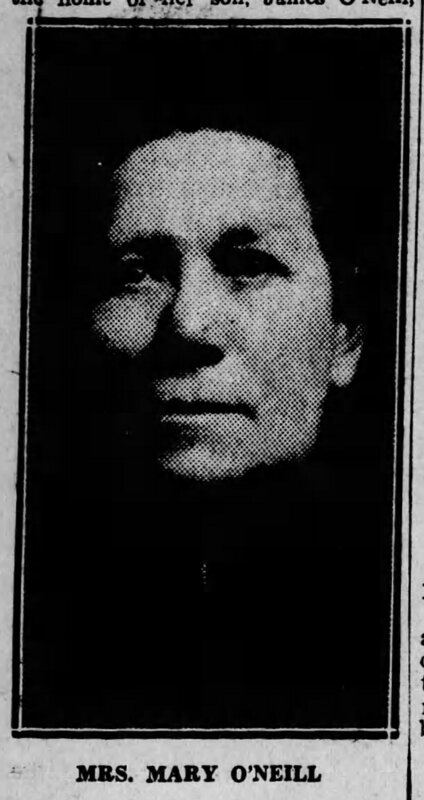 Here’s to Lena Feller, of Van Meter, Iowa, a nurse, a teacher, and mom to Hall of Fame Pitcher Bob Feller. On May 14, 1939 – Mother’s Day – while watching her son pitch for the Cleveland Indians from the front row in a game against the White Sox, she was clouted by a foul ball pitched by her son. And, then she did what any Baseball Mom would do. Knocked silly, with blood pouring down her face from a foul ball pitched by her son, she told him not to worry about her and to keep playing. She then was carried out of the stands and hurried to the hospital by ambulance. Feller won the game, defeating the White Sox 9-4. After the game, Feller raced to the hospital. And, so, apparently, did a sports photographer who took this uncomfortable photo of Bob and his family standing at Lena Feller’s bedside. Here’s to all of today’s busy “Baseball Moms,” who deftly juggle family, work, practices, and games, including my friends Pia, Wendy, and Beth. 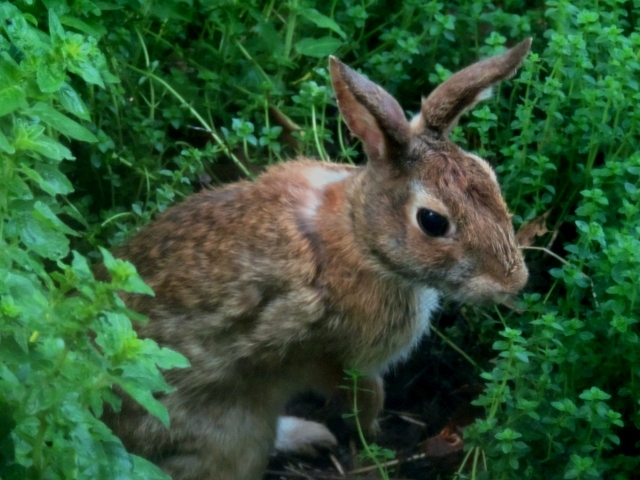 Here’s to the rabbit who, on Saturday morning, spent an hour building a nest in our patch of thyme and oregano. Now the nest is ready, and soon the rabbit will give birth to five baby bunnies, give or take a few. The babies will live in the little thyme nest their mother built for about a month before they get on with things on their own. In the meantime, the thyme patch is off-limits to the rest of us. And, here’s to my mom. She’s been gone for 10 years now. 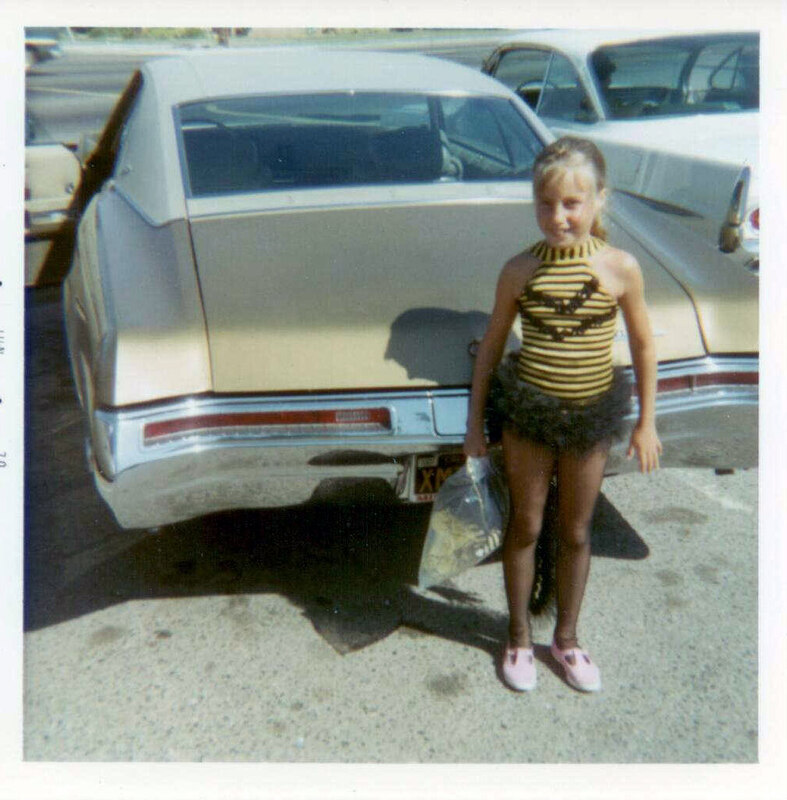 As busy as a “Baseball Mom,” she was a “Ballet Mom,” ferrying me to ballet and gymnastics classes and practices and performances after school and on weekends for many years. This also included sewing and altering countless costumes for countless performances, even though she hated to sew. It’s me. I’m a bee! Nearly every day I come upon something she has written to me – a note, a letter, a recipe, a few words on the tab of an old file folder in a drawer. Just to see her handwriting makes me miss her. I saved her last bottle of perfume, because it smelled deeply of her. But now, the last remaining bit is nearly evaporated and today it smells mostly of air. I miss not only her, but the scent of her. She would want me to mention again that her favorite color was purple. Here’s to all the moms. The ones who love pink and the ones who love purple and the ones who love baseball and the one who loves you. This entry was posted in Baseball, Baseball History, Life, Mom & Dad and tagged Baseball Moms, Bob Feller, Ladies Day, Mother's Day by Jackie, The Baseball Bloggess. Bookmark the permalink. You’re right….you do miss their smell. You really should write a book. You’re easy to read. I too have the last bottle of my mother’s perfume, “White Shoulders”. She been gone 42 years now. Still miss her. Enjoyed the article. Thanks. Thank you, Marty. Maybe all the daughters keep their mom’s last bottle of perfume. Just to have that lasting connection to them and their mom-scent. Wonderful post! 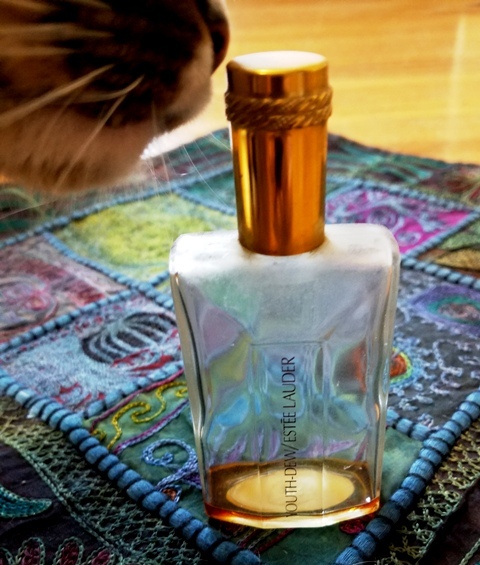 Catching a whiff of Tresor – Mom’s latter favorite – also makes me tear up. Interestingly, my mom always wore another fragrance until she returned to Australia after 13 years to see her mom and dad. After that trip, she couldn’t be around that fragrance ever again without melancholy, realizing how very much she missed her parents, siblings, and extended family half way around the world…. Great, fun read! My mom always had perfume bottles on a mirror topped tray. With 3 legs, had to place those bottles just so, or it tipped! I am proudly wearing purple here in Denver and today’s giveaway to the moms is jewelry! Now if the rain would stop and give us sunshine! Personally the pink and purple splashes reminded me of Easter eggs running around out there. It was a vision! Loved the umpires pink masks! Orange scarfs? Yep, too hot! Love this post! 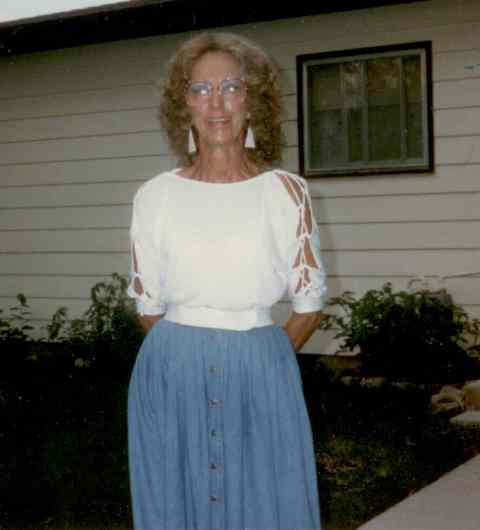 My mom died in 2004 and not a day goes by that I don’t think of her. She didn’t wear perfume much, but when she did it was White Shoulders. She wasn’t really a baseball mom because my brother didn’t play for long, but she was most definitely a softball mom as I played as a kid and into college until I got hurt. I don’t think she ever really understood the rules, etc. but she had a loud voice and I could always hear her cheering and yelling at umpires, coaches. Like you, I sometimes will come across something she wrote. It’s tough to lose a mom and even tougher on Mother’s Day, but at least we have our memories. Thanks for writing this. Miguel Cabrera says that it was his mom who was the ballplayer in his family, and taught him how to play. My mother, possessed of all the maternal warmth of a crocodile, only ever expressed one opinion about playing ball, and that was that my friends and i were wearing bare patches on the back lawn where our home plate and pitcher’s “mound” happened to be at any given time. I once read one of the Niekros (Phil, I think) say that his mom made a similar complaint, and that his dad replied “We’re raising boys, mother, not grass” I wish Mr. Niekro had been handy when I needed his intercession. One of the high points of my childhood was hitting one (a whiffle ball) into the upper deck at Tiger Stadium (the roof of the screen porch) in left field. To be honest, my mom was a basketball fan — except for one brief dalliance with the underdog Mets in 1969. My dad was all hoops, too. I had to find baseball on my own. But, while my mom didn’t understand my love of baseball, she did appreciate my passion. If you’re going to love something, she believed, love it for all you’re worth. Love it as hard as you can. Otherwise, you’re just wasting your time. Your son knew to give you the perfect TV for watching Tigers games? That’s a loving, wonderful son. Happy Mother’s Day to you, CoalBlack! Awe. This was such a good read. I grew up watching baseball and now my son plays too. 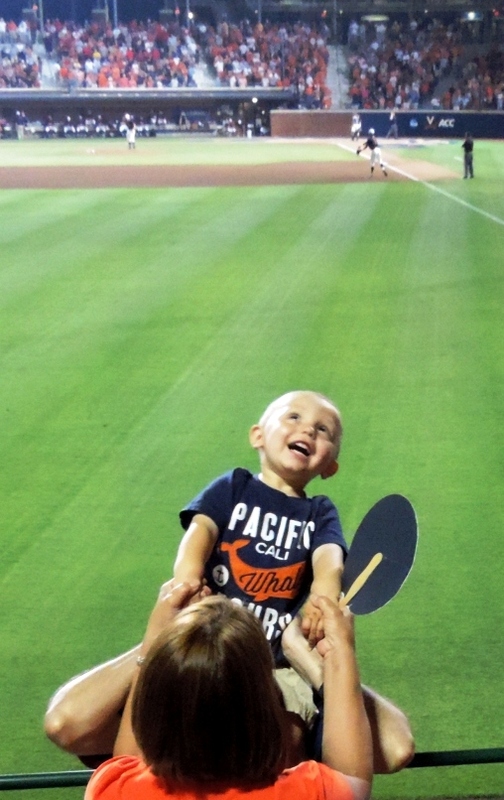 I love when parents and children share a love of baseball. It’s so fun to see them at games together … either as fans or at childrens’ games. I think those are very special and long-lasting memories.